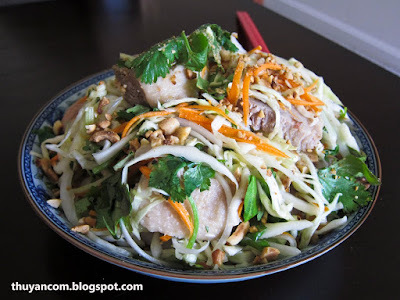 Like I have mention many times before, Goi Vit is my all time favorite salad. Today was such a hot day, it just put me in the mood for something light and flavorful. In Vietnam a plate of Goi Vit usually consist of sweet, tender duck meat on top of shredded banana blossom and morning glory. All the ingredients is soaked in this wonderful concoction of fish sauce, lime juice, and sugar. It is so good that I always slurp up all the excess dressing at the very end, when my mom isn't watching of course. Like Goi Ga, you HAVE to use coriander leaves in Goi Vit. It must be poultry thing! When there is coriander leaves, I just can't leave out the onions. You get spicy sweet from the onions and spicy bitter from the coriander leaves, they are just meant for each other! I don't always have access to banana blossom so I replace it with cabbage and carrots. Cabbage doesn't really have a lot of flavor, it's really there for texture. So all the ingredients I use such as the mint leaves and cilantro really compliment the shredded cabbage. I want this dish to set a pace for my cooking for the rest of the summer, lots of flavor! 1. 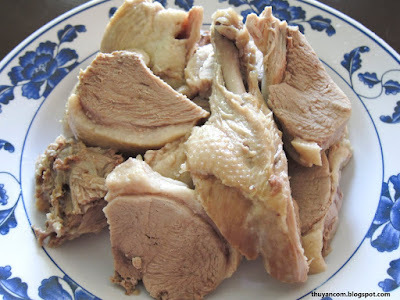 Boil your duck in a pot of water until fully cooked. You can use the broth to make soup such as Bun Mang. 2. 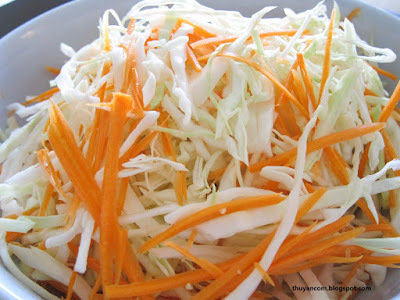 Finely shred the cabbage, thinly slice sweet onions, and julienned carrots. 3. Marinade the cabbage, carrots, and onions with 4 tablespoon of vinegar and 1 cup of sugar for like 15-20 minutes in the fridge. 4. Rough chop the cilantro, coriander, and mints, set aside for later. 5. Crust roasted peanuts and set aside for later. 6. Remove the duck and let cooled. Butcher into smaller pieces. 7. Drain excess fluid from the cabbage mixture, no need to squeeze the juice out. 8. Add the duck pieces to the cabbage mixture. 9. Squeeze one whole lime to the cabbage/duck mixture, add 2 tablespoon of fish sauce, fresh chilies to your liking and mix thoroughly. 10. Mix in the fresh herbs right before serving and top off with some crush roasted peanuts. Thuy, I will try your salad this week when I can buy a duck. I absolutely love Goi Ga, and Goi đu đủ. I always order it whenever I go out to eat at a Viet or Thai restaurant. I even named my blog after it somewhat. If I am lucky my wife will make this delicious dish for me. Thanks for the recipe. If you love Goi Ga or Goi in general, you will love Goi Vit! Thank you and I hope you and your wife will enjoy this dish. darn it, i thought this was going to be easy. can't you buy canned beans? Been totally craving gỏi lately. I agree with you about the importance of rau răm, there's no substitute.